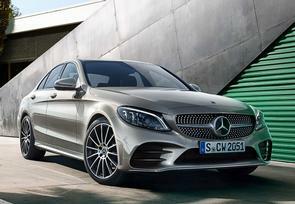 The updated Mercedes-Benz C-Class (in saloon, estate, coupe and cabriolet forms) has arrived in Irish dealers and prices start from €37,710. The updated C-Class looks only subtly different to the outgoing version (basically, the changes are limited to new lights, bumpers, slightly altered grille and some new wheel and paint options), but inside the changes are a bit bigger. Although it keeps the separated instrument cluster and infotainment screen (unlike the 'digital plank' layout of the A-Class and E-Class) the C-Class does now come with optional digital instruments. There's a new 12.3-inch TFT screen for the gauges, which can be customised by the driver. There's new software for the Comand infotainment system too, which comes as standard with a seven-inch display, but which can be upgraded to a 10.25-inch screen. Those new lights can also be optionally upgraded to Multibeam LED units, which can, according to Mercedes, throw their beam as far as 650 metres in front of the car. There is also some new switchgear and a new steering wheel that now comes with the touch-sensitive pads, taken from the A-Class and E-Class, and which also contains the cruise control buttons. Under the bonnet, the existing C 180 d, C 200 d, and C 220 d diesel engines carry over, but there is a new petrol option - a C 200 mild hybrid, using a 1.5-litre turbo petrol engine, aided by a 48-volt electrical system and a small electric motor. That can give a 14hp kick to the engine to aid performance, or can take care of some of the ancillary systems to take the strain off the engine and improve fuel consumption. On the safety front, there's now active lane-changing to go with the active cruise control and lane-keeping, active steering that can swerve you away from an incoming collision and if the system can't see any clear lines on the road, it can briefly follow the car in front until it picks up a clear picture again.